May 7, 2012 July 24, 2013 - by Ilda - 44 Comments. The Philippines is such a happening place lately. First, the 45th meeting of the Asian Development Bank (ADB) Board of Governors was recently held at the Philippine International Convention Center in Pasay City. 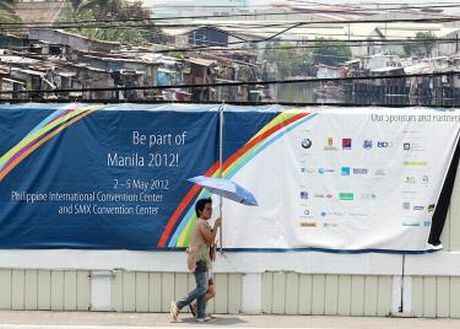 It was interesting to note that the Aquino government’s preparation for the event was to cover up what they obviously considered an eyesore — the slums along the highway that runs from the Ninoy Aquino International Airport (NAIA) to the convention center — by building a temporary fence. Their idea of doing a “little fixing up” of Manila is so 1970s, back when former first lady Imelda Marcos used to do it for international visitors. The Filipino people could not forget her for what she did then. PNoy’s administration is starting to look more and more like a copycat of past administrations. It’s no wonder that he is beset by the same problems. As usual, President Noynoy Aquino blamed former President Gloria Arroyo yet again and took credit for her work in his speech delivered in front of the ADB delegates. PNoy’s critics can pretty much predict his line of thinking and because of that, there is hardly any surprise at all when one finally hears him speak. One just gets a a feeling of déjà vu — that all of it, the speech and its message, had transpired before. And it has. Every chance he gets, PNoy takes the opportunity to blame his predecessor for his own shortfalls. Only his blind followers will not see through his style of deflecting people’s attention from his lack of real accomplishments. One can be forgiven for saying that PNoy’s emotional intelligence is low because his speech was devoted to badmouthing GMA just to make his own administration look good. I mean, it’s one thing for PNoy to act vindictive in front of Filipinos but it is quite another that he would do the same with a bunch of highly-intellectual delegates from overseas. I’m sure they can do the math and see for themselves that most of what he is saying has not been proven in court yet. He wasn’t specific about the why and how of what he said; that “Gone are the days when the funds you funnel to our country will end up like water leaking through a broken pail.” Such allegations are quite unfounded considering GMA was never charged with gross misuse of funds coming from the ADB. It is good that PNoy chose ADB meeting to engage in his blame game. Asian finance czars know the undeniable gains achieved by our country & people in the past decade, including our fiscal turnaround which made Sec. Teves the Asian Finance Minister of 2009. As reported by ADB itself, our nation rose from being ASEAN’s laggard to one of its fastest major economies in 2007-2010. In 2007, only Singapore’s 8.8% topped Phils’ 6.6% among original ASEAN 5. In 2008, Thailand and Singapore trailed our 4.2%. In 2009 global recession, only Indonesia & Phil grew. And in 2010, our 7.6% expansion beat Indonesia and Malaysia , and matched Thailand’s. Now two years under Pnoy, growth is down, poverty & hunger are up, and he can only vilify the past for his failings. The ADB delegates must have been secretly rolling up their eyes while PNoy was trying to grab credit from GMA’s work yet again. Doesn’t he realize that the country’s economy would have collapsed by now if all his allegations were true? How can PNoy sleep at night knowing that most of what he is alleging against GMA are baseless? It’s worth saying again that PNoy has done nothing significantly different from what the past administration was doing. He’s just trying to embarrass himself when he speaks ill of his predecessor. PNoy’s interview with CNN’s Anna Coren was equally disappointing to say the least. The award-winning journalist sat down with PNoy as part of CNN’s “Eye on the Philippines” program. You could tell that Coren, who has interviewed dozens of foreign dignitaries around the world, was trying to probe PNoy about his fight against corruption, but PNoy’s lame responses left her with nothing to work with. It was apparent early into the interview that she wasn’t going to get a straight answer from him about anything. When Coren asked PNoy how he would rate his progress on his promise to eradicate poverty, his answer was so far off course. Instead of giving Coren facts and figures, PNoy simply gave the journalist a narration of how when he was a congressman he spoke to about 80 graduating nurses and asked them how many of them were willing to stay and work in the country; he noticed that there were only about two or three students who raised their hand. To him this meant that in the past, the Filipino people were voting with their feet. PNoy didn’t say how many people are still willing to stay in the country now though. In other words, his response to Coren’s question was not really a valid answer. PNoy wasn’t specific about how he formed the perception that poverty in the country is on its way out. Coren was too polite to bring up the poor’s favourite dish pagpag. Maybe PNoy didn’t want to hear about it too just like how Senator Tito Sotto didn’t want CNN featuring Filipinos eating their meals from garbage bins. Besides, I don’t even know why PNoy thinks that Filipinos who are forced to leave have other options other than to look for opportunities abroad. And if the OFWs weren’t willing to sacrifice leaving their family behind to look for a job overseas, our economy would be worse off without their remittances. It seems PNoy doesn’t even know what he is talking about. When Coren asked PNoy how he is winning the battle against corruption, PNoy’s response was quick. According to PNoy, the fact that his predecessor is already in jail is a good indication that he is winning. Never mind that GMA is only in custody pending her trial against the charges of electoral sabotage only and not even for the other allegations of misuse of public funds that he keeps telling the public about. PNoy could have mentioned that she still hasn’t been convicted in court. But that would be too much to expect from someone whose response to such questions sound terribly scripted. PNoy even boasted to Coren that he wants to “expedite” to ensure “conviction”. He said this as if railroading the case and ignoring due process is equivalent to getting justice for all parties involved including the accused. This prompted Coren to ask the obvious question: Is PNoy singling out GMA in his fight against corruption? PNoy’s response was as lame as the others. His only justification was that, as the Chief Executive, GMA should have done something about the transgressions during her time. Okay. If we are to follow his logic on this, then he should do something about the transgressions committed by public servants during his term. He should start with the Congressmen who allegedly signed the hastily- and badly-written articles of impeachment against Supreme Court Chief Justice Renato Corona. PNoy and his supporters can continue fooling themselves into believing that everything is going well according to their plan. It’s a bit pointless to insist that it’s not because he is not open to criticism. He’ll just lump you with the people he calls “happy with the status quo”. The fact is, he is actually doing well to maintain precisely that status quo. While I haven’t seen the interview yet, it’s pretty much safe to assume where that went — south. Kidding. I’ll check it out to give a more fair view. 1. If corruption was like a crime syndicate, with FPGMA and FFGMA as the alleged heads, then I can say that there can be a minute semblance of “victory.” However, we all know the real story. It isn’t like Ness versus Capone. Besides, organized crime didn’t die after Capone landed in jail. I wonder how corruption will die if CGMA is in jail. If she is a crook, she still doesn’t control all the crooks in this country. Ano yun, mananawagan siya sa lahat ng corrupt na magbagong buhay na? I say weed out every single one of them. Don’t focus on figureheads. 2. PNoy needs to remind everyone that GMA was the head of a corrupt country and that she led us down that path. I think this is out of more practical reasons. Why? Knowing the passive nature of the poor Filipino, they will forget about GMA and focus on more pressing matters — like how to stretch that pagpag or stretch a packet of instant noodles to feed a family of 5. Without GMA, PNoy ceases to be relevant in this world. If there’s anything I can associate with presidents that didn’t do a lot of blaming, it’s the period of “growth” that went along with them. Um, check out the time of Ramos and GMA. I don’t recall Ramos putting a lot of blame Cory or even Marcos. I don’t recall GMA hitting Erap too much. She just sent him to jail. This might sound amateurish, but if headline corruption went up those days, was it partly because there was also a lot of money going around? There was a semblance of economic activity. Tie that in with the loopholes in the system, instant money making machines (corruption). Bring that same “logic” in today. Why are they claiming corruption is down? Um, is it because the gov’t hasn’t been spending on big projects? Anyway, I think PNoy should consider PAYING GMA every time he mentions or refers to the previous administration to prop himself up. It’s been 2 years already. Wala pa bang ibang ulam? Parang pagpag na si GMA. Indeed. Noynoy’s moronic pitch is based on the flawed premise that the character of sitting presidents actually determine national economic performance. Fact is there is no evidence that a strong causal relationship exists that links who is President and how the national economy performs. For that matter, even changing the system of government itself cannot be shown to necessarily precipitate change in the fortunes of entire nations. Hmmm, what if they bring back the death penalty? I mean, apply it only to public servants. If the GDP falls below growth targets, they get the chair. That should scare them enough not to run for public office. Only those with enough cojones and smarts will be left to run. Hehehe. Seriously, even if we change the system of government, we’ll still have the same people who will run it. We will still be the same Filipinos run by it. A change in the system should be accompanied by a drive to change the people. Policies and enforcement of laws should drive that behavior. Some change don’t even require a change in government. You want more entrepreneurs and businesses? Make it easy to start a business. In Arche’s article, it’s 35 days average. Like, how’s that helping? Find the bottlenecks, get rid of them. I sure as hell hope that those stupid business plates with faces aren’t a leading cause of delays in permit issuance. You want a manageable population? Start implementing ways to slow down growth. Start thinking of how to multiply resources to cover the existing population — without the need to get a loan and package it as a poverty reduction measure. As for next presidents, it’s important that they start mentioning deliverables. I think the time for feel-good Kodak moments is over. The least they can do is show the people that progress is attainable and not just some feel good dream sequence ending of a telenovela. No measures = more frustration. I wonder how corruption will die if CGMA is in jail. If she is a crook, she still doesnâ€™t control all the crooks in this country. PNoy thinks that GMA is already in jail anyway but he still blames her for everything even after two years in office. I don’t understand how he can keep going on and on about it. He sounds like a middle aged woman. Hey! That’s an insult to women! Asking permission to share your thoughts here in Cebu. It has already been 2 years and we still have this sham of a president in power with no achievements whatsoever (nope, jailing GMA does not count). I believe that Pnoy’s time in power will soon come to a screeching halt when he faces his impending impeachment trial. Since day one, I didn’t see anything worthwile that PNoy did for the nation. Late in his Yolanda mercy mission about 3 days as noted by CNN/Anderson. Very late and still not progressing at all about the Ampatuan 59 victims mass murder case, The PDAF scam until now none was ever indicted so all the perpetrators will resign their post, The corrupted AFP from an old copter past as new, the pabaon, the Euro generals, the Cadet Cudia shangheid to civilian life for just 2 minutes late to his class by a corrupted honor system that’s not working among top generals who are thieves themselves, the P35 billions spent already on Yolanda devastation but no visible effects in the immediate environs, all palpak. Was it because he’s bakla or womanish? I rated him 35% in his job performance. He should resign already for a better Phil. No wonder PNoy likes foreign media better, he can spin the story for them all he wants to! Too bad foreign media don’t have many more sources on the ground who don’t need to tread as lightly as foreign correspondents lest PNoy considers it an “international incident”. No wonder PNoy likes foreign media better, he can spin the story for them all he wants to! This government thinks that foreign journalists are dumb. On the contrary, they are very professional and would not show how they really feel about the person they are interviewing. They do their homework prior to the interview so they can form their questions. It was obvious that Coren was just being polite even though she could not get a straight answer from PNoy. In the1970’s, in the effort to beautify main thoroughfares, Imelda Marcos did not make any temporary fences as what Pnoy is doing. Its more of a permanent beautification effort. But hey…what can i say about Pnoys way of thinking, everything can be fixed with a duct tape or a band-aid…whichever…. Mr. BS Aquino early on showed his penchant for blame games and creating scapegoats. The objective of this game is to point the finger at everyone perceived as his enemies. This is followed up by black propaganda, trial by publicity, hate-think, and constant poisoned press releases. Blame them for everything. Creating scapegoats for all his failures, blunders and shortcomings makes the administration look good at the expense of its perceived enemies. This hypocrisy of the straight path mantra misleads a lot of gullible and ignorant minds to believe in his continuing great lies. The great leader’s administration relies on this strategy of false slogans and promises. The propaganda machine of Mr. BS Aquino can’t fool all of the people all of the time. It’s a formula that seems to work well for PNoy and his minions. Nice article. I’m sharing this thru my Facebook account. Again to me, this country’s situation is very similar to Portal 2: imagine an ordinary Filipino as Chell, GMA and Marcos as GLaDOS and cory and noynoy as Wheatley. You’ll get the whole picture if you played that awesome first-person puzzle game by Valve. The cake is still a lie for this country but noynoy is a lot dumber than wheatley though. Philippines is a country rules by oligarchs, with laws especially made for the oligarchs by the oligarchs. The most unbelievable things are happening every day and people just do not know any better. Noy Noy may be a little slow but there are limits to what he can possibly do without being killed or accused of something he did not do. Funny that some mention Fidel Ramos, he was the most corrupt of them all but quite efficient, especially in controlling dissidents with his little black book with all their sins in it. He stole more money than any other president to day. Even more than Marcos? I thought Marcos took the lot! Mr. BS Aquino likes to cover up sensitive issues. Many took note of his famous quotes. He likes to “beautify” squatter areas. Is his administration totally free from graft and corruption? Its too bad that PNOY has turned out the way he has thus far, but then again, that is what happens when Filipinos elect a man who won merely on the sympathy vote. If anything, he is an accidental president because his mother died before the election. if she were still alive, he would not be president today. He has four more years to make a difference, but sadly, I don’t see him taking advantage of his time in power to make the country a better place. Blame games, credit grabbing, love life stories for popularity, speeding up of trials, what else???? No, thank you, Hyden. KriSTD is NOT how any sane man would want to go. I just hate the Al Capone way the Aquino government is trying to convict its “enemies”. Remember how the mob boss was sent to jail not for being an “eevil” gangster but for tax evasion! Sure, Arroyo, Corona, and company are probably guilty of something (as are the rest of the 99% of us Filipinos). But if they’re going to be sent to jail or removed from office for corruption, let it be for corruption and not some accounting error or wiretapped “soundbite”. BLAMING is a PERSONALITY DISORDER called Schizophrenia…..hay naku…kung totoo.na magkapatid nga ang mga ninuno ng mga ito…ay talagang mahaba na ang sayad….ang alam lang ni PNOY ay magkaroon ng strategy na kng paano nya talunin si Josh sa XBox games….dun sya magaling…(pero di nya daw kayang talunin si Bimbi…kaya ok na magArtista gaya ng Nanay)..,.GISING NA ANG TAONG BAYAN….KAILANGAN NG KUMILOS AT PATALSIKIN ANG MGA ITO….mga kasabwat nya sa Gobyerno…MAGPAKATAO NA KAYO…KONG AYAW NYONG MATAWAG na may Sayad din KAYO…matagal na tayong inuulol ng mga ito….tsk…tsk…tsk…galit na ang taong bayan….DIVINE INTIGNATION. i smell coup de etat plus people power revolution, military and civilians will unite to kick Pnoy on his seat. this will happen anytime soon..
Old article. Be an interesting read. Situation must be worse now that it’s 2014.